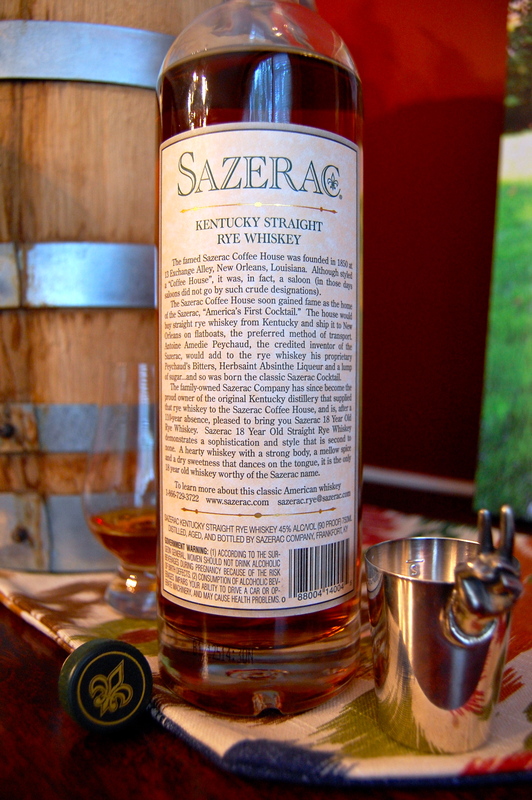 Sazerac 18 year old rye is an interesting spirit, a rare spirit, an epic spirit. It’s released just once a year as part of the equally epic Buffalo Trace Antique Collection, with just 28 barrels per bottling. Since at least 2006, the single source for this bottling has been a distillation completed way back in 1985 and put into stainless steel tanks sometime in (or after) 2003. So each year, the Sazerac 18 is the exact same whiskey, with the exact same time aging in oak barrels, but just a year older in the tanks. John Hansell over at Whisky Advocate reported on the details of this case a few years ago, pointing out that it was originally stored in a 13,500 gallon tank, then moved to three individual 2,100 gallon tanks to lessen the interaction with oxygen (though not treated with inert gas to completely stop oxidation). Clearly, there is still interaction with oxygen – each year, the Sazerac 18 tastes a bit different, and each year, there is a bit more loss to evaporation, even in stainless steel. In 2007, the net loss from original barreling was 51.9%. In 2008, it jumped up to 54.1% (maybe that was when they moved tanks??). Then 56.1%, then 56.5%, then 57.3%, and now 57.6% with this 2012 release. Even still, the annual Sazerac 18 bottlings are kept at a constant 90 proof. This is the one bottle I’ve secured so far out of this year’s Antique Collection, and it is, as expected, mighty impressive. Here are my notes, and a final thought at the end comparing the 2012 Sazerac 18 to my favorite well-aged rye. Sazerac 18 carries a deep, red amber hue and an intoxicating smell that speak well to its age – deep and full. The most prominent notes on the nose are of dark brown sugar and the oil of an orange peel, that burst of slightly bitter but bright citrus you get when you squeeze a peel over a cocktail. Clove comes in to complement the dark sugar and citrus, and a vanilla-leather mustiness underlines it all. The interesting thing is, the age on the Sazerac rye mellows much of the rye character in the nose. Just a sniff reassures that this is no doubt a beautiful, mature, American whiskey, but the time in the barrel (and the tank) has dialed down the spicier rye notes. Once you take a sip, that rye character does start to reemerge. The entry is sharp, the orange peel turns towards bitter orange, and evergreen-ish herbaceous notes assert themselves a bit more. There’s still a strong core that reminds me of Bit-o-honey candy, full of caramel-honey-almond, but this is not an overly sweet whiskey by any means. Also, it’s worth pointing out that, despite the advanced age, the oak here is fully in check. Sure, you pick up charred wood, but it in no way dominates the conversation. The finish on the Sazerac 18 sings long and warm, with that sharp rye entry coming back to visit the roof of the mouth, a touch peppery, a bit grassy even. There’s that chewy Bit-o-honey quality also, lingering throughout. As I’ve tasted this over the course of the last week and half, I’ve become more impressed with the 2012 Sazerac 18. It’s full of character and a fascinating and delicious drink for any whiskey lover, especially those who dig well-aged whiskey (without the overbearing oak that many well-aged whiskies tend to develop). Overall, I give it a full-on Wow* and highly recommend grabbing a bottle if you ever see it. Now, as for how this stacks up versus other similarly aged ryes – my benchmark is the Van Winkle Family Reserve Rye, which I’ve compared previously to some other fine ryes. Tasting these two side by side is a treat, but I still give the edge to Van Winkle, which has a bit more rye character on the nose, and ultimately delivers a more harmonious balance through the palate and on to the finish. Either way, I wouldn’t pass up the chance to buy either of these epic ryes. For a great deal of detail on this 2012 Sazerac 18 year old rye, please see Buffalo Trace’s excellent and much-appreciated info sheet. Funny — some others haven’t been that impressed with the Sazerac Rye 18 YO. Not “Wow” impressed anyway. Might I suggest you put a rating entry either at the top, bottom, or with the whiskey data? You should never make someone go looking for that. Thanks, Jim. I’ll give some thought to showing the rating more prominently, though my ratings are intentionally a bit broad so you readers can focus more on the description rather than the end rating per se.